Honest Burgers. Not exactly an unknown entity for most savvy Londoners who use the internet, but I wanted to start this post just to say I love this place, cos they do tasty burgers, but also – they are really, really nice. And it is so reassuring when people are actually good. We’ve been partaking of these most tasty, and peculiarly English, burgers for a couple of months now after we (finally) made it in to explore Brixton Village Market. What can I say? We’re kind of recluses. Reclusi. Funnily enough, the first time we went for a wander, we did indeed see Jay Rayner standing larger than life, presumably considering which of the many options there were for his lunch. Anyway! The burgers. Oh my god. Very good. Yes. And gluten-free. Their specials look great but it’s the honest burger that I can’t resist. 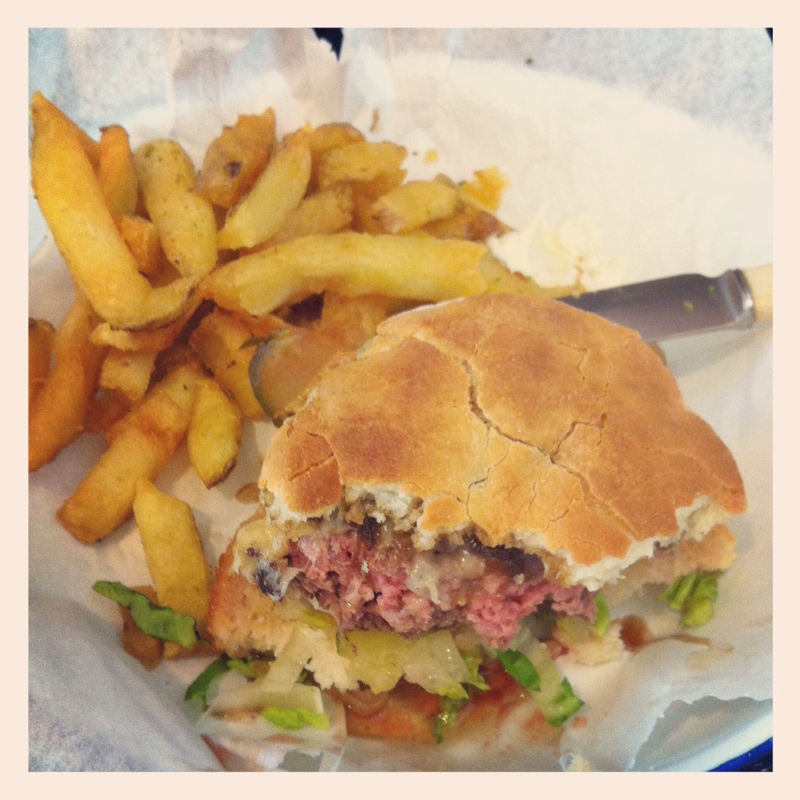 Beef burger, pink in the middle (always) with pickles, and cheese – choice of English cheeses – and onion relish, with rosemary fries, crispy and delicious. They have the perfect crunch. And a gluten-free bun from the WAG (Wheat and Gluten-free) bakers down the end of the market. They work pretty well although I am still jealous of the glazed buns the gluten-eaters get! 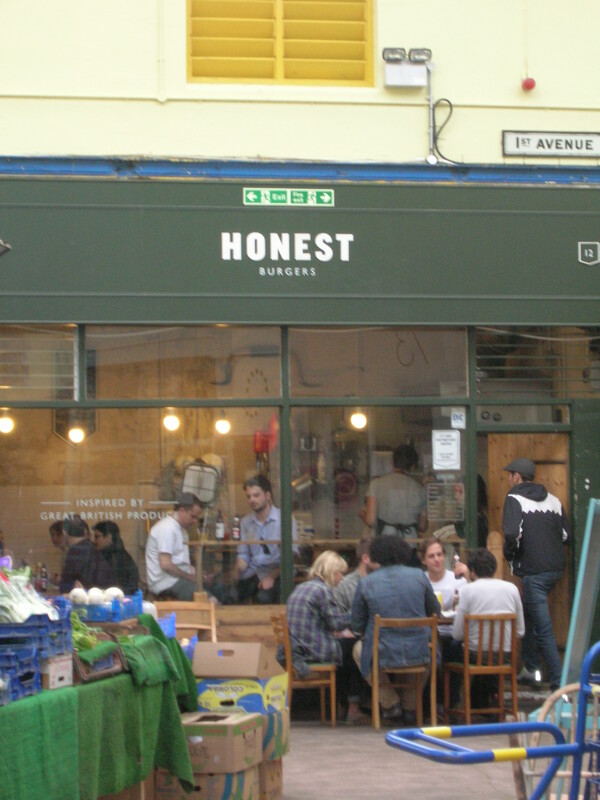 This is what made me fall in love with Honest Burgers – when we waited for an hour for our oppurtunity to sit, we found out they had run out of gluten-free buns. Sheer horror on our faces prompted our waiter to dash down the hall to the bakers to beg a bun – he came back with a loaf, gratis, only to be told they had already restocked! So he gave us the loaf. Now that is class. Stuff all this careful waitering – give me someone who will RUN for my dinner any day. Then we went to the Ritzy cinema to watch The Avengers, a perfect day perfectly ended. Maybe I should get L to expand on that though! I just enjoyed the film. Ahem. Sorry. I think I must have worn myself out effusing now, I have nothing left. Sorry, but it really is how I want to talk about them even in person! 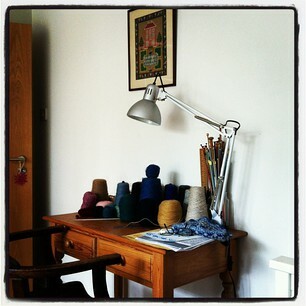 After all that getting out the excitement, time for some settling down for a day of knitting. The bottom picture is how I started, and how I usually work. Not pretty. So the top picutre is how I cleared my mind to try and get somewhere! 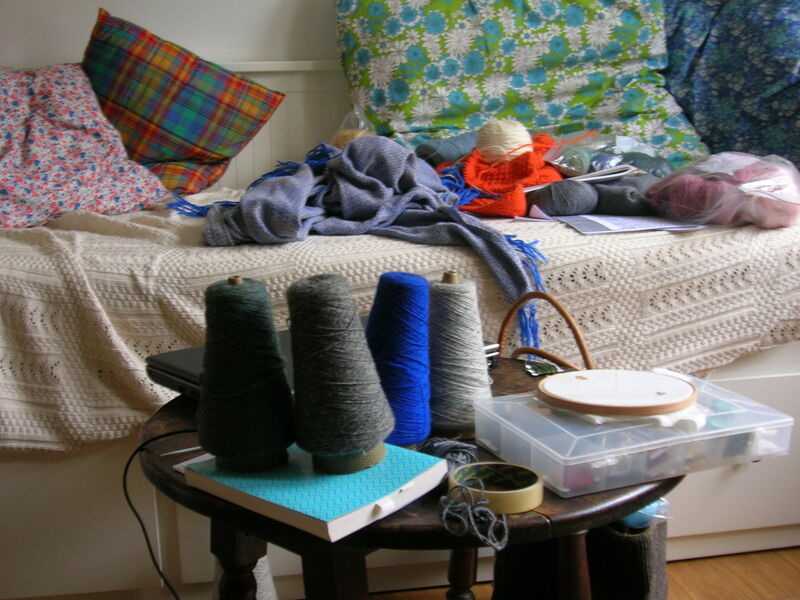 I’ve had a stash of Shetland yarn culled from charity shops in Aberdeen for some time, and I am determined to knit a fiar isle jumper from them. It’s hard to resist the sheer endless numbers of patterns and colours and combinations of fair isle. The skill and the difficulty of it is making it work in a balanced way, so that the patterns work in harmony with the colour changes, while the patterns don’t overwhelm each other. Knitting is not hard for me, I like the challenge and learning different techniques. But choices! Not my forte. And trying to decide on which patterns to go for and how to use colour is really really hard. L does it almost without thinking, because she has a real talent for it, developed with seriously beautiful cross stitch samplers that she used to do… before I hooked her on knitting.